Find your perfect fit. 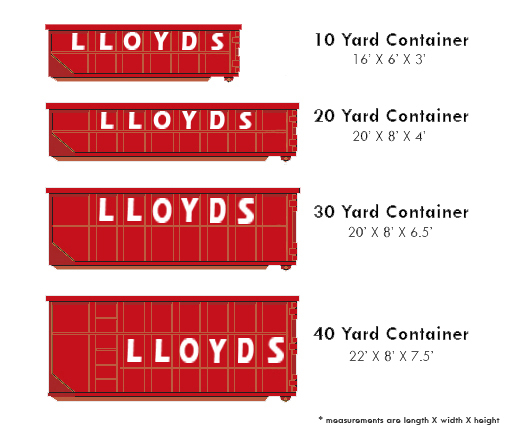 Lloyd’s carries a variety of sizes of roll-off containers to meet your needs. Whether you need a box for a garage clean-out or multiple containers for an upcoming project, our experienced and educated drivers and courteous office staff will work with you to meet your specific requirements. All construction and demolition material we haul is handled with the utmost care for our environment. Each container is separated to extract as much recyclable material as possible, saving resources and diverting large quantities of debris from the landfill. Recycling reports are available for every container, letting you know how much material was extracted specifically from your box. Our drivers are trained to safely and efficiently deliver your container in the most difficult of conditions, 24 hours a day, 7 days a week. Call into our offices to learn more about pricing of our containers and how Lloyd’s is the superior choice for your waste management needs. What can go in your dumpster? Please call us with any questions you may have on items you are placing in your container and we will be more than happy to assist you.